Some common hiker’s questions about hiking along the Heysen Trail are answered here. Is the Heysen Trail open year-round? 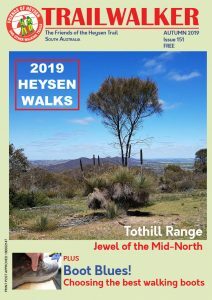 Do I need a map to walk the Heysen Trail? How long does it take to walk the entire Heysen Trail? Are there any organised walks along the Heysen Trail? Is water available along the Heysen Trail? Are there safety considerations for walking along the Heysen Trail? Is there mobile phone coverage along the Heysen Trail? What should I do if a member of our group or myself become injured when walking along the Heysen Trail? What if I get lost while walking along the Heysen Trail? Can I camp along the Heysen Trail? What facilities do campsites along the Heysen Trail have? Is other accommodation available along the Heysen Trail? What transport options are available for accessing the Heysen Trail? Can I walk a dog along the Heysen Trail? Can I ride a horse or bicycle on the Heysen Trail? Who maintains the Heysen Trail? No. The Heysen Trail is only open to walkers during autumn, winter and spring, and closed during the summer Fire Danger Season, generally from November to April. The viability of the Heysen Trail is dependent on the continuing co-operation of private landholders, so the trail closure times must be obeyed at all times. The sections of the Heysen Trail that are on public roads or vacant land, in forests, national parks or reserves remain open year-round, except on days of a Broadcast Fire Ban. More details about the Fire Danger Season. Yes. As with all bushwalking and hiking you should carry and refer to a map. The Heysen Trail has been marked with distinctive markers, but sometimes these can be difficult to follow. From time to time, it is necessary re-route sections of the Trail. GPS files are also provided for use on handheld GPS units. More details about maps. Walking the entire 1,200 kilometre trail would take between 50 and 60 days. The Friends of the Heysen Trail offer an End-to-End group walking program. Walkers are welcome to join at any time and walk those walks that interest them. The Friends of the Heysen Trail issue a certificate and badge for those completing the whole Trail. Yes. The Friends of the Heysen Trail offer an End-to-End group walking program. Walkers are welcome to join at any time and walk those walks that interest them. Sometimes. Much of the Heysen Trail is in semi arid country, such as the Flinders Ranges. Here, water can be scarce or non-existent and the nearest town can be up to 80 kilometres away. Even in winter day temperatures can be quite warm. This makes it necessary to pay careful attention to water supply. A minimum of two litres should be carried, and three to four litres per day if backpacking. When walking, top-up your water supplies wherever possible and, if you are uncertain of water quality, make sure you filter, boil (if fires are allowed), or use water purifying treatments or tablets. Water can be found in tanks at campsites, but whilst every endeavour is made to ensure that there is water of potable quality in these water tanks, that water might become polluted. For your safety, carry enough for your needs or treat the water with chemicals or purification methods. Yes. As with all bushwalking you need to be prepared. More details about safety considerations. Mobile phone coverage is limited in most regional areas. In remote areas it may be worth carrying an EPIRB device. Mobile phone service providers often provide network coverage maps which can help you assess the extent of coverage. Generally Telstra coverage is superior to all other mobile service providers. In the event of an accident, or if someone becomes too ill to continue, provide appropriate first aid and shelter. If the sick of injured person cannot be moved, seek assistance. Determine whether the person can be helped by the group, or if extra help is needed. Make contact with Emergency Services by phoning 000 or 13 1444. If contact cannot be made and rescue is needed, a competent person with first aid skills should stay with the injured or ill person to reassure and care for them until help can arrive. If you have to wait to be rescued, look for shelter and water on the trail. In hot weather, stay in the shade, drink water and reduce loss of body fluids by moving only during the cooler part of the day. In cold weather, keep out of the wind and try to remain warm and dry. If possible light a fire, or huddle with others. If you get lost, try to retrace your route until you find a marker or recognise a feature. If you can hear sounds of human activity, shout to attract attention. Be on the lookout for well-travelled roads or occupied buildings. Walkers may consider using a GPS unit in combination with their map and trail markers to further safeguard from getting lost. Yes. Scattered along the Heysen Trail are numerous campsites and shelters, varying from either stone or timber settler’s cottages and old public buildings to modern shelters. Tents are permitted only in these areas. More details can be found via the Google Maps feature by selecting the Accommodation layer. Most of these facilities are very basic offering only a small sleeping shelter with a rainwater tank. Walkers should aim to be totally self-reliant. These huts incorporate facilities such as a rainwater tank, simple bunks, toilet, fireplace, tables and seats. Huts cannot be pre-booked or reserved, so you are advised to carry a tent in case shelters are fully occupied upon your arrival. Avoid digging trenches around tents. Remove any rubbish when you leave. Always carry a fuel stove and use it frequently as campfires scar the landscape. Observe low impact camping practices and don’t burn or bury rubbish. Each individual campsite page on the Google Maps provides photos, and details of location and facilities. Yes. The route of the Heysen Trail takes it past many towns with excellent overnight accommodation options available. Bed & Breakfasts, Farm Stays, Hotels, Motels and Caravan Parks can be found along the Heysen Trail in many areas. More details about accommodation. Car parking is available at various points along the trail, generally in towns, public car parks or on road sides. Some sections of the trail are accessible by bus services, by private operators or by individuals. More details about transport. No. Dogs are not permitted on parts of the Trail that traverse private property or through National Parks, however the exception is when sight impaired people have a guide dog accompanying them. Dogs are permitted on public roads and in Forestry SA forests, but not in native forest reserves. Please refer to the ForestrySA website for more details. No. The Heysen Trail is for walkers only. The 900km Mawson Trail from Adelaide to Blinman in the Flinders Ranges is for cyclists. The 170km Kidman Trail from McLaren Vale to the Barossa Valley is a multi-use trail for horse riders, cyclists and walkers. Details of these trails and others are available at the Trails SA website. Both horse riding and cycling are permitted in Forestry SA forests, please refer to the ForestrySA website for more details. Walkers should consider other trail users in Forestry SA forests and give way to both horse riders and cyclists. The Heysen Trail is maintained by the Friends of the Heysen Trail with the assistance of a number of walking clubs. We welcome feedback about maintenance. More details about trail maintenance.